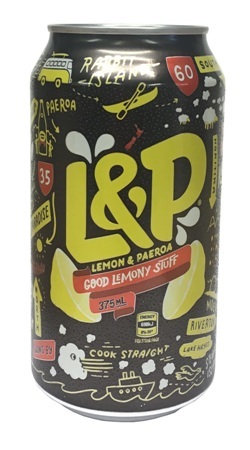 Lemon & Paeroa, L&P, is 'World Famous in New Zealand'. This citrus drink is a New Zealand Icon. Originating from the town Paeroa, where the spring water was mixed with lemon juice, it has become one of the most popular drinks. I drank this in new zealand. Gorgeous drink!! I didn't actually try this in NZ, I found it in Sydney of all places. This drink is amazing. Totally refreshing, I shall be ordering more in the future. My son Peter (aged 10) just loves this. He was introduced to it by his grandma in Auckland. At home in the UK, we buy it for him on special occasions ! This is the best soft drink in NZ... I am very happy that Sanza offers it in europe to a reasonable price! That is, shipping to Switzerland as well. WoW I've been trying to find where I can buy this for so long now, over the moon I've tracked it down! first tried this in newzealand, actually drove to where it was made, and frankly no fizzy drink has come close to matching this one in terms of quality, freshness and taste. Would recommend to all, is a MUST buy ! I first tried this in New Zealand (obviously) in a little cafe not far from Queenstown and had been obsessed with it since. It's so nice, not too fizzy, balance of lemon flavour is just perfect, not too sweet, not too sour. It tastes immense with Southern Comfort or Bourbon. Quite simply, it's the worlds best Lemonade. Anyone who has been to New Zealand must surely have tried L&P! My partner and I were delighted when we found it here on Sanza and swiftly ordered several cans. A lovely refreshing drink, with a unique flavour. Reminds us of driving around the islands. To taste it at it's best, make sure it's left in the fridge for a good few hours.